Sorry for the delay in my blog .... but I am feeling rather blogged out! I am getting ready for a solo art show in Port Alberni. Getting ready for an exhibiton is a whole lottta work! This week, I went around to some of the galleries and gift shops where my pieces of work were on consignment, and picked up those remaining. Then at home, I carefully examined each piece; were the frames O.K., or damaged or knicked, is the wiring still in tact, had each piece been signed and named on the back? Some of my older pieces hadn't, as this is just a recent practice that I really think is a good idea. The back of each piece should be signed exactly, as you sign it on the front, also (if you like) with a copyrite © and the year that it was created. Next they get checked off on my master price list, before they get packed for delivery. Phew .... oh yes, this morning we made a quick trip to Walmart to purchase a plastic container, for transporting some of the smaller pieces. I still have to finalize my price list and finish framing three pieces. Then they are delivered on Tuesday. Remember: for all of you on the West Coast, please drop by Saturday, April 25th at the Rollin' Art Centre, at the corner of 8th and Argyle from 1 - 3pm. I will be painting up a storm! Please drop by and say hi - have a coffee and snack. The show will be quite impressive with 38 acrylic pieces. 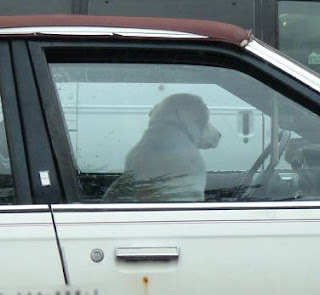 The photo above is called "Anything Goes", as out here in Bowser it is common to see dogs sitting in the driver's seat. I told my dog, Cheyenne, that no way was I going to let him drive my new car!